Red River College: can you feel the love tonight? Red River College grads are goin' places, workin' hard, and makin' money, at least according to its most-recent grad survey results, posted here. Results are based on the Satisfaction and Employment Survey of 2006/07 graduates. 1. Workin' hard or hardly workin'? "Of all full-time program graduates who responded to the survey, 95% were employed or furthering their education. Of those graduates who were in the workforce, seeking employment, 97% found jobs." In CreComm, it's 79 per cent employed, and seven per cent in school. 2. Outstanding in your field, or out, standing in a field? "Almost 88% reported they were working in a field related to the education and training received." In CreComm, it's 72 per cent in full-time positions and two per cent in part-time positions. 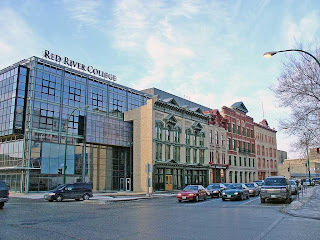 "Over 93% of respondents reported they were very satisfied or satisfied with their education at Red River College and 93% said they would recommend their program to others." In CreComm, there are two surveys. On a student-evaluation survey, 90 per cent said they were satisfied with the program, and 88 per cent said they would recommend it to others. In the graduate satisfaction survey, 98 per cent said they were satisfied with the program, and 100 per cent said they would recommend it to others. "Graduates also reported their starting salaries. While results vary by program, the average was $34,833, which was an increase of 2% over that reported by 2005/2006 graduates." In CreComm, the salary range was $22,000 to $50,000, with an average of $33,474. I'm guessing they wait a year before surveying us because by that time we're more likely to be gainfully employed in an industry-related position. The cynic in me also figures that the extra year is likely to cause people to more fondly recall their time at RRC than they might immediately following graduation. I look forward to my chance of participating in the survey. Yep, they wait before calling. And, yep, that leap in satisfaction is what happens when people have a year to get over whatever personal antagonisms they have toward me. Time heals all wounds; or, as Nick Lowe said, "Wounds all heels."